Early in the year, mega game studio Electronic Arts announced it was producing a sequel to its action-horror-scifi title Dead Space …but the surprise was that the company’s Visceral Games was planning to product the sequel for the Nintendo Wii—a platform not known for its action titles, particularly of the rated “M” variety. Now, EA has made good on its promise: Dead Space Extraction is now shipping for the Nintendo Wii. And, yes, it has monsters and goo and gore, and yes: it’s rated M.
The story follows four colonists as they try to avoid and figure out the “necromorph” infection, which threatens all of humanity (and, naturally, the entire universe). Dead Space Extraction centers on the new character of Lexinne, who apparently has to be kept safe if there’s to be any hope of combatting the infection. Players have a decent arsenal of weapons at hand, with a control and combat system specifically engineered to leverage the Wii controller. 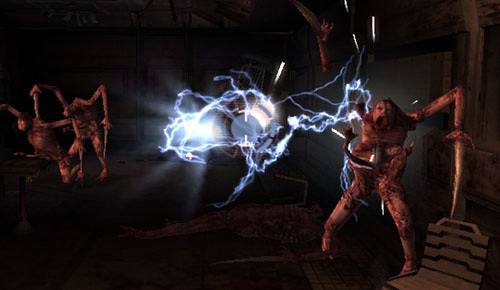 The game also features a new co-op mode, something missing from the previous Dead Space title. Dead Space Extraction is available now for the Nintendo Wii for $49.99.